In our most recently aired DFT® Inc. webinar, about Water Hammer, our experts discussed the definition of water hammer, the effects of hydraulic shock, and how to prevent water hammer using DFT Axial Flow Silent Check Valves. If you missed this webinar, it is now available on demand on the DFT® website. 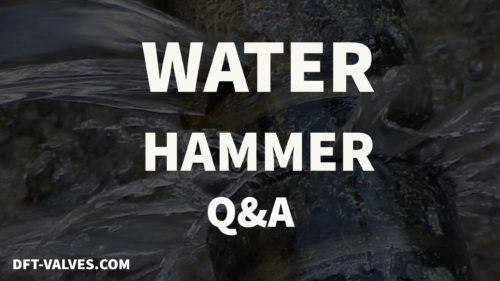 Our expert host also answered some of your most common questions regarding water hammer solutions, outlined in Q&A format below. What is water hammer? How do I prevent it? Water hammer is a hydraulic shock event that is caused by the sudden closure of quarter turn valves, or more commonly the sudden shut down of pumps. Pumps that are pushing water into vertical pipelines are almost always guaranteed to cause water hammer when they shutdown. The best way to prevent water hammer is to install axial flow check valves (and only axial flow check valves) as close to the pump as space will allow. If you use a swing check in this application, the valve will only be closed by reversing flow. The reversing flow will slam the valve closed causing the water hammer. Why does a cold water system need an expansion tank and water hammer arrestor? The system you describe probably has vertical runs of piping in it somewhere. f those vertical runs are close to the pumps supplying those systems, and those pumps are protected with swing check or double door valves, the reversing flow that happens when the pump shuts down causes the water hammer. The cold water in the system plays no part other than to transmit the hydraulic shock wave of the water hammer event. You mentioned that the second cause of water hammer is hot and cool water meeting. Is there a way of mitigating water hammer in this situation? Mixing very hot water with a much smaller volume of cold water will cause the cold water to expand rapidly. This rapid expansion can cause shock waves to propagate through the liquid medium. If you have a system that has both phases of water, steam and liquid, then you have the potential for water hammer to occur. You should make sure that there is no accumulation of water at any low points in the piping system. If there is, it would be a good idea to install drains and steam traps at those low points. Hot water can become steam when the pressure is low enough. What is the pressure drop of this style check vs. a normal swing check? Pressure drop through a valve has to be calculated knowing the media, the state of that media (gas or liquid) and the pressure/temperature properties of the media. The equations for determining pressure drop require a valve flow coefficient known as Cv. This is a characteristic of a valve that is determined by analytical testing or Computational Fluid Dynamics. Typically, the Cv of a swing style valve is a higher value than the Cv of an axial flow check valve. This may not be a bad thing, in fact it may be desirable to have a check valve with a lower Cv to insure that the flow through the piping and thus through the valve is sufficient to fully open the valve and maintain a stable full open position. 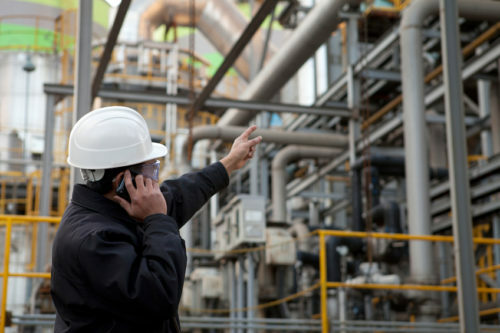 What can be done for a process where a control valve needs to be shut down quickly? Make sure you calculate the time constant for the specific installation for the control valve. Normally control valves are not fast acting valves, but quarter turn ball or butterfly valves do close quickly. Make sure you make the valve closing time greater than the calculated time constant so that you decelerate the liquid slow enough to prevent creating the shock wave that would be associated with sudden stoppage. Check Valve Solutions from DFT® Inc.
For more than 70 years, DFT® Inc. has helped customers diagnose check valve problems, provide solutions, and prevent failures. We specialize in providing the right in-line check valves to meet customers unique application requirements. From world-renowned DFT® Silent Check Valves to the innovative DFT HI-100® Control Valves, we have the products you need and a team of valve experts with decades of experience in a range of industries, including power generation, petroleum, construction, chemical processing, steam, water treatment and many more. To learn more about our valves and how we can assist you, download our eBook, “Check Valve Installation Rules & Guidelines” or contact us directly. DFT® Inc.’s Vice President and General Manager Arie Bregman recently gave an in-depth, solutions-oriented presentation on water hammer — a common issue that can lead to devastating effects. Arie is an expert in the valve sector, with over 35 years in the valve industry, with companies such as Nibco, Jamesbury and Metso. Arie holds a Master of Science degree in Mechanical Engineering from Worcester Polytechnic Institute and is active in the Valve Manufacturers Association in the US, serving on the Education and Training and the Technical Committee and is also a member of the VMA Board of Directors. The first step to treating water hammer is, of course, properly identifying it. Loud sounds — a series of banging, clanging, or rattling noises — often alert operators to the first signs of an issue. Chances are you’ve probably heard the sound of water hammer in your pipes at home or at your plant without even realizing it. The webinar also delved into the precise definition of this phenomenon: Water hammer is a hydraulic shock that occurs in a liquid piping system, often to devastating effect. Water hammer can cause gasketed joint and expansion joint failure, pipe wall crack and joint leaks, deformation of piping support systems, and many other issues, all of which can lead to high costs and increased downtime. Next, Arie discussed many people’s main concern — how to prevent water hammer and avoid the numerous problems it can cause. Because water hammer is often only briefly touched upon in engineering schools, it’s critical to have an expert like DFT® available to answer questions and provide advice for your specific application. Working with an experienced, knowledgeable partner will make all the difference when dealing with water hammer, helping you to avoid unnecessary expenditures, downtime, and general stress. At DFT®, we’ve been producing top-quality in-line check valves for over 70 years, helping businesses across all types of industries avoid water hammer. Our expert team has deep expertise in identifying, solving, and, most importantly, preventing check valve failures. 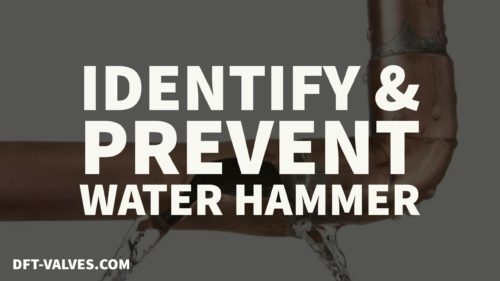 If you missed Arie’s water hammer webinar, or want to refresh your memory on some key tips to keep in mind when preventing and treating this issue, check out the full webinar video today. Or, to learn more about DFT®’s valve manufacturing capabilities, reach out to our team directly. At DFT® Inc., our SCV-R® Check Valves exemplify our commitment to providing products that can withstand the toughest environments, including applications with high cracking pressure. These products are fully comparable to their counterpart, the DFT® Model SCV®, but with enhanced features that allow them to endure high cracking pressure conditions—including a spring-assisted, non-slam design that reduces or eliminates water hammer. Many advanced applications require check valves for high cracking pressure. Cracking pressure is the point at which the valve opens and the media is introduced to the system. Using a spring-assisted design, DFT® Model SCV-R® Check Valves are ideal for such advanced applications. With versatile, corrosion-resistant features, they are also cost-effective, making them a preferred option in a number of uses. Water hammer is another common problem affecting applications that require check valves, often signified by a loud hammering sound coming from pipes. The condition arises when valves either shut too quickly or pumps suddenly shut down, causing the moving water to backflow when encountering the closed valve. High versatility allows valves to be used in both vertical and horizontal installations. Easy maintenance helps to extend service life. Stainless steel construction provides the utmost strength and corrosion resistance—even in the harshest environments. Usability in many different applications, including hydraulic lines, boilers, pumps, and compressor discharge, makes the valves incredibly versatile. To explore our full selection of durable, cost-effective SCV-R® Check Valves, download a free copy of the SCV-R® cut sheet. You will learn how these self-contained valves provide unparalleled reliability and service life for virtually any liquid, gas, or steam application. Each year, the Valve Manufacturers Association of America (VMA) hosts a series of highly regarded Valve Basics Seminars & Exhibits to give industry associates — ranging from engineering students to experienced professionals looking to broaden their subject knowledge — a hands-on crash course in valves. Last month’s three-day seminar hosted approximately 70 participants at the Embassy Suites Chicago O’Hare in Rosemont, IL. The dynamic program featured several speaker presentations highlighting different aspects of valves and valve safety, as well as the iconic Valve Petting Zoo, where attendees participated in hands-on demonstrations of what they’d learned earlier in the classroom. The Petting Zoo, a relatively new addition to Valves 101 developed based on past participant feedback, turned out to be the highlight of the program. On the second day of the seminar, after each speaker had an opportunity to present, they showcased their topics in action as attendees rotated around nine different stations to gain further understanding through hands-on learning. DFT®’s own Director of Sales and Marketing, Jeff Kane, and Regional Sales Manager, Bud Volz; have had the honor of presenting the Valve Basics Seminar & Exhibits for the past several years. This year, Kane’s course segment in “Valves, Actuators & Controls 101” focused on the subject of check valves, the importance of check valve sizing, and preventing water hammer. In his presentation, Kane discussed how correctly sized check valves can minimize unnecessary costs by preventing low flow situations that lead to valve failure, as well as high velocity flows that can cause high-pressure shock waves (commonly known as water hammer. Students are given an unbiased presentation regarding the features and benefits of all the popular types of check valves. Valves 101 will be stopping at the Sheraton Houston Brookhollow Hotel in Houston, Texas on October 18-20 for the next installment of the Valve Basics Seminar & Exhibits program. To date, over 1,500 people have attended these workshops; the VMA looks forward to expanding this number and continuing to spread the word on the importance of valves and valve safety. To find out more about the next Valve Basics Seminar & Exhibits program and how to attend, visit the VMA.org website.